Take a look at that red candle – that’s a good 200 pips in just 4 hours! To be honest, I really didn’t expect the pair to drop so quickly. I was a little concerned when news broke out about North and South Korea, and I thought that the yen would get sold-off. Indeed, that was the initial reaction, but once the London session came rolling around, the euro got sold like a copy of Black Ops when it was first released! Apparently, there are growing concerns that after the Irish accepted a bailout last weekend, other countries, namely Portugal and Spain, may have to request for bailouts as well. The result? 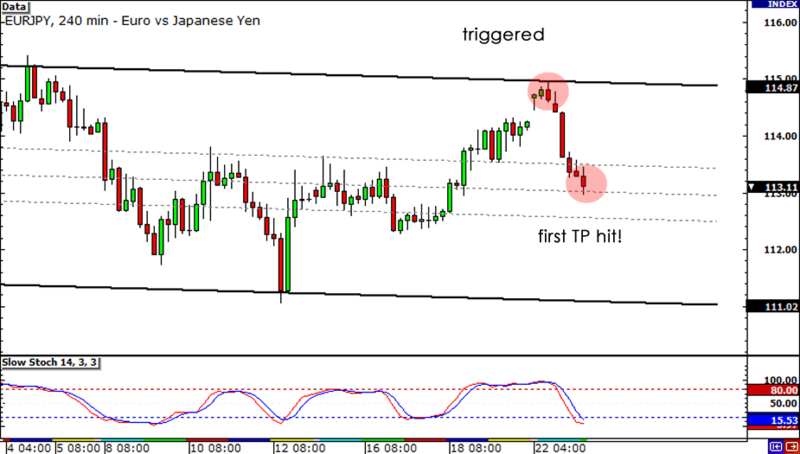 EUR/JPY tumbling over 200 pips and hitting my second PT! The trade turned out quite profitable for me. 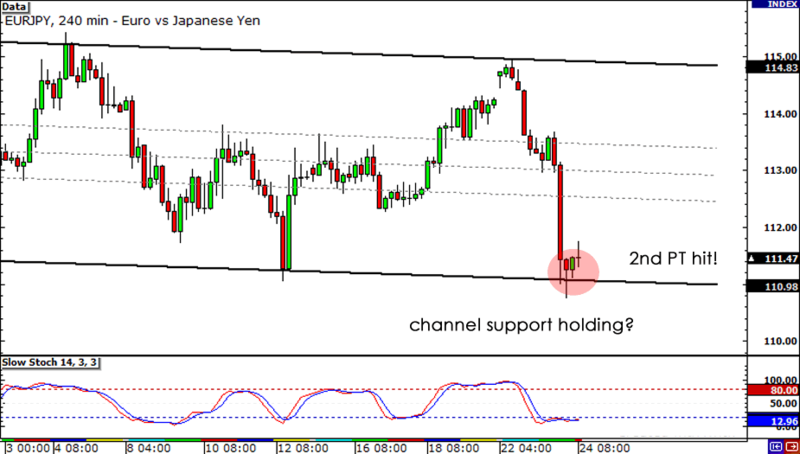 I do think that I set my take profit targets at the right areas (at the middle and bottom of the channel). I do admit that I caught a bit of luck in this trade, with the nice run of risk aversion that we saw this week. I certainly didn’t expect the pair to drop so quickly. So while it feels good to finally grab a nice win, I must stay focused and humble and look for the next great setup. Thanks for all the comments fellas and thanks for reading my blog! I caught a lucky break yesterday, as I was able to get triggered at the top of channel. Price didn’t quite reach 115.00, but it’s a good thing my orders were at 114.90, otherwise I wouldn’t have gotten triggered. Euro pairs gapped up over the week, as the Irish finally decided to accept a bailout from the EU and IMF. However, the euro couldn’t sustain its gains and fell across the board. Apparently, there are those who fear that other countries (ahem, Portugal and Spain) may have to tap into the special EFSF program and get bailed out as well. This left the euro vulnerable, helping out my trade. In any case, my first PT at 113.00 was hit and now the pair is chillin’ in the middle of the channel. So it’s time for me to make some adjustments. First PT hit at 113.00. Moving stop on remaining position to 114.90. PT2 at 111.00. So now I’m trading on the house and I’ve locked in a pretty decent profit. Let’s see if the euro bears will stay in force, or if we’ll see risk appetite come back in play during this shortened week. Once again, my beloved EUR/JPY is stuck in a range. Take note that In the past, EUR/JPY has shown that it normally trades between support and resistance levels, before breaking out to merely trading in another wide range. Right now, it looks like the pair is trading in a slightly descending, horizontal channel. It has found support just above of 111.00 and resistance at the 115.00. It’s the 115.00 level that’s got my one good eye seeing a sweet setup. I’ve looked back at the charts, and I see that the 115.00 level has served as a strong area of interest in the past. I think we could find potential resistance at this area, so I’ll be looking to short at this area. I know, I know, it’s a long way to go. But earlier today, Pip Diddy told me that the market reacted positively when Ireland set aside its ego and expressed openness for an ECB-IMF loan (aka bailout). With that said, I think that the shared currency will be able to hustle a little bit more to the top of the range and trigger my trade. With not many high impact reports coming out from the euro zone next week, I think we could see this pair stay within range. 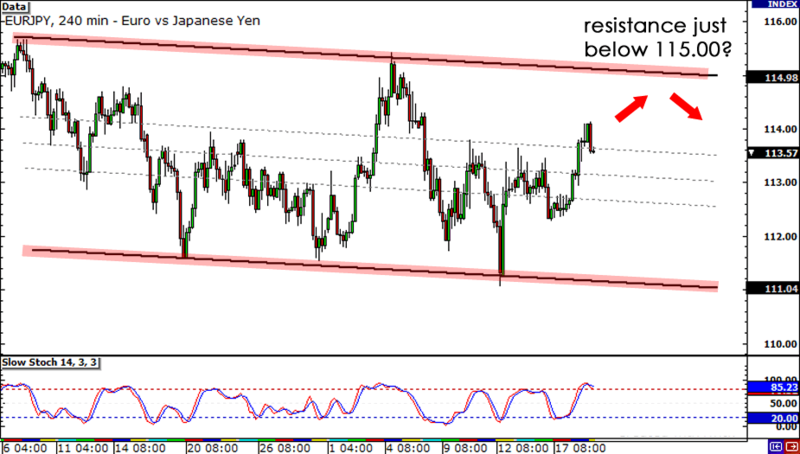 Hopefully, other sellers are looking at the major resistance and will help send EUR/JPY all the way down to the bottom of the channel. I’m placing my short orders at 114.90. I do expect the pair to test beyond the 115.00 level, but you know what they say, you can’t always get a perfect entry. My stop will be at 116.10, way past the previous highs, giving me a stop of about 120 pips. This gives me a stop that is roughly equal to the daily average true range. As with any channel, I’ll be aiming for the middle (113.00) and the bottom (111.00) of the channel as my take profit points. If both targets are hit, this would give me an average win of 300 pips, which is about 2.5 times my initial risk. A 2.5 to 1 reward to risk ratio? I’ll take that! Short EUR/JPY at 114.90, stop loss at 116.10, take profit at 113.00 and 111.00. Now I just gotta be patient and wait for my trade to get triggered. For now, Imma get ready catch that Patriots and Colts matchup on Sunday! Oh yeah baby! Who ya putting your money on, Tom Brady or Peyton Manning? Don’t ya just love football season?